Real food is unadulterated, authentic, whole food that is cultivated in the manner that nature intended. Real Food Eatery is a relatively young company with unique perspective about the food service industry. The first location to open at 16th & Walnut in 2016, cofounded by Mike Mangold and John Colasante, introduced the brand’s “real food” concept to Philadelphia. Since then, two more locations have sprung up on Market Street and City Avenue, strengthening the brand’s presence in the Philadelphia area. The primary goal for each location has been consistent, to convey the same message about the design of the space as the company does about the food they serve. The environment of the space expresses the authenticity and freshness found in their menu’s offerings. 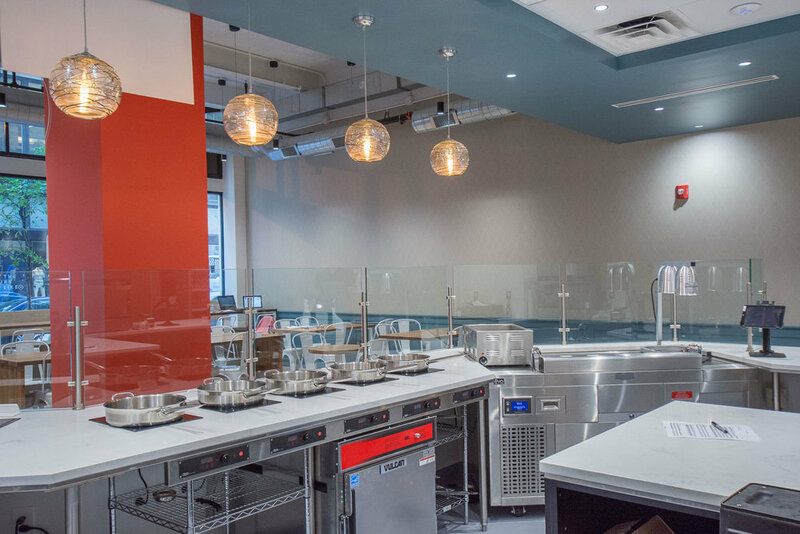 Real Food Eatery enters a food industry market with a significant amount of competition. The importance of unique identity among the parade of other food establishments in the area is paramount. The functionality of the space is also required to handle the capacity of walk-in customers while fulfilling a host of mobile orders throughout hours of operation. Each store location is of different square footage, entry configuration and overall footprint. A thoughtful approach was taken to incorporate functional kitchen space, approachable customer service counter and a diverse group of seating styles. The customer experience was the main driver for service counter layout, walk-in queue sequence and accessibility to mobile order pickup. The dining areas were assorted to accommodate various group sizes and configurations whether it be a communal group table or an individual bar-height window seat. Authenticity and cleanliness were the driving factors behind the overall aesthetic of the space. Just as the Real Food brand believes that “simple is the ultimate sophistication” the space was meant to fulfill that philosophy using honest, natural materials. Since most of the meals on the menu contain only a few ingredients, the finish palette was to be just as minimalistic. Fresh neutrals and warm wood tones are accented by a bold blue and vibrant red throughout the spaces. The furniture selection maintains the same clean, natural materials similar to the rest of the space. Light hickory toned wood used to clad the service counter alongside polished solid surface and glossy wall tile and crisp, bold color accents suggest “west coast” vibe. Consistent general downlighting provides uniform light throughout with the use of wall washing track fixtures to highlight key design elements and signage. Simple decorative fixtures are placed selectively to distinguish points of entry and customer service area. The importance of brand identity at the kick start of this company was a high priority. Maintaining consistency in design goals was often challenging given the varying sizes and configuration of each existing space. The pre-existing conditions like utility system infrastructure and entry configuration were the main influences for the new layout of the space. The brand-related elements were thoughtfully incorporated into the context of each establishment.